Minimalist, Unique & Quirky: 36 Mehendi Designs For The Bride-To-Be! One of the most significant pre-wedding functions for a bride is her Mehendi ceremony where her hands and feet are adorned with henna. Usually, it’s an intimate affair where the relatives dance and sing and commence the shaadi festivities. Indian weddings are deeply rooted in culture and tradition and the henna on a brides hands holds a lot of significance. 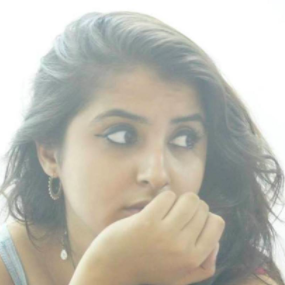 What is The Historical Background Of The Mehendi Ceremony? Mehendi is one of the oldest body art forms conceived by man and can be traced back to as early as the bronze ages. 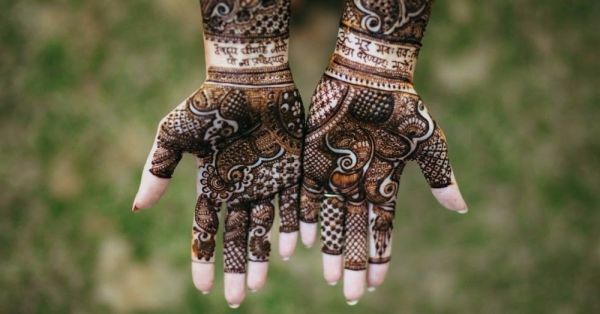 The Hindi and Arabic word ‘mehendi’ is derived from a Sanskrit word ‘mendhika’ which refers to the henna plant. It is believed that the art of body painting spread from India to other parts of the world like Egypt, Asia Minor, and the Middle East. In many of these parts too henna is considered auspicious and in the Hindu culture, it is considered to be a part of the customary sixteen adornments or the solah shringaar. What Is The Significance of Mehendi? Mehendi represents the holy bond of matrimony between a groom and his bride. It is hence considered a sign of good luck or shagun. It signifies the love and affection between the couple and their families. In some cultures, even the dulha puts a dollop of mehendi to tie in with the auspicious ceremony. The darkness of the mehendi is said to signify how deep the love and bond between the couple is going to be. The darkness and rich colour of the mehendi is also supposed to show the understanding and closeness between the bride and her to-be mother-in-law. The longer the mehendi retains colour, the more auspicious it is said to be for the newlyweds. Mehendi is also supposed to be symbolic of fertility. Henna is also known for its medicinal properties and apparently protects the bride and groom from viral infections before the D-day. It is even known as a cooling agent and may be used to keep the two calm during the wedding stress. Over the years there have been many henna designs that have become popular. From dedication to God to minimalist designs and ones with a personalized touch, all have found their way to the palms of the brides. And if you’re a bride, we know just how hard it can be to pick out a design that you love and one that goes with your personality. So, to help you out, we’re listing all the types of bridal mehndi designs you could get on your hands and feet. The Mughal mehendi design is an ode to the kings and queens of the yesteryear. It is intricately designed by the mehndi artist and resembles the royal customs that used to be followed back then. Queens used to spend ample amount of time dressing up and putting henna for her king and even the artwork is taken from the Mughal era. All in all, for that regal couple having the grand, desi shaadi, this one is perfect. Hindu weddings are knee-deep in culture and rituals and every function begins with a puja, seeking the blessings of the Almighty. God portraits in a bride’s Mehendi are also common and considered auspicious. If you are a big believer or even if your family is, adding some elements of the Holy God would be a good idea, this way you know that He is always close to you. Some dedicate it to eternal love stories like that of Lord Krishna and Radha while others choose to represent Gods like Lord Ganesha who symbolise wealth and wisdom. If you want to match your hands and feet, you can get patterns like peacocks and lotus in your feet so that your henna looks completely in sync. If you aren’t one to go for the traditional peacock, ambi or booti design, this circular mehndi trend is perfect for you. It looks stunning on both the hand and feet and if minimal designs are what you prefer, then this is all you need. For a more bridal look, add florals to the mix and amp it up. You can even add the classic criss-cross pattern as the base for a fuller look! Another modern looking pattern is the geometric mehendi design. For those of you who don’t like curvy patterns and prefer neat and straight lines instead, opt for this. Match the henna design on your hand with a geometric pattern on your feet as well. As for the accessories, avoid a traditional haathphool and pick a quirky statement piece instead. The peacock pattern is one of the most common mehendi designs and it looks absolutely gorgeous on a bride’s hands. Bird motifs are extremely popular and you can either get a large one to be the focus of your Mehendi or incorporate it as an intricate detail in your henna. You can add floral patterns as well to keep the theme more earthy and close to nature. If you think peacocks are done to death, do consider getting a parrot design in your mehendi. It looks adorable! Bride and groom portraits is a classic mehndi design that you can never go wrong with. Recreate your wedding look in your mehendi or just opt for designs that depict scenes from a wedding ceremony. A mehendi design that shows the groom putting sindoor on the bride's forehead is a favourite amongst brides. Arabic henna designs resemble Turkish artwork and architecture. Many people wonder how this henna style is different from the traditional mehendi design. The most evident difference is that it is more spread out and calls for more blank spaces, unlike the Indian henna which intricately fills the entire hand. If that’s the look you’re going for, then you’re in luck coz we’ve got all the patterns for you. Do you not like the smell or look of mehendi but have to put it coz it’s your wedding day? Don’t you worry, the minimalistic mehendi design trend is here for you. If you are generally into the trend of pastels and keeping the whole affair on the down-low, then this is the style for you. You could keep your entire look subtle or if your lehenga is too OTT, a minimal mehndi design will balance things out. What is a 2018 wedding without a cool shaadi hashtag? You can go with something as simple as mushing the bride and groom names together or you can go for something completely out of the blue like Sonam Kapoor and Anand Ahuja’s #EverydayPhenomenal. Nowadays, hashtags are a part of the wedding decor and invite, so why not put it into your Mehendi too?! If not the hashtag, add the initials of both your names in your hands. If not the dulha-dulhan portraits, get portraits of the two of you in your mehndi design. Nothing says aww-dorable quite like this! However, because this is so detailed, you need to hire a mehendi artist who can actually pull this off…you don’t want end up with a portrait on your hand that doesn’t even look like you or your to-be hubby! Let your love for personalization show in your henna design too. A brand new trend, the love story Mehendi is a great way to add a touch of you to your design. Be it the place he proposed or a depiction of the romantic dates that you can never forget. 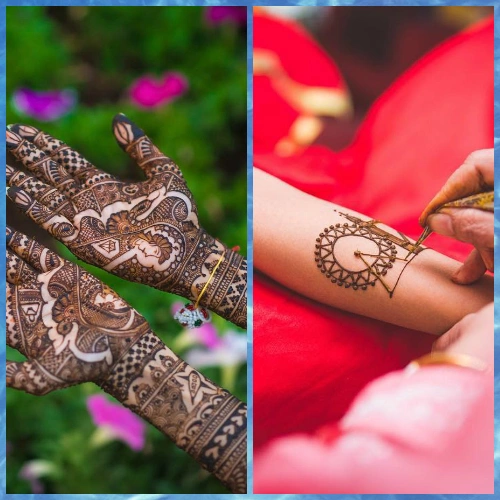 You can also customize your wedding mehndi to add cities you’ve been to, the proposal date and other elements from your love story to really make it one of a kind. There are things that you love and have utmost passion for, and those are things that make you, you! Since they are such an integral part of your life, it only makes sense to make them a part of your wedding, if only as your mehendi design. This can include your pet or can include a sport you love, a dish you crave for all the time or your fave destination in the world. So dulhaniya, get the cheeni and neembu out, coz mehendi hai rachne waali!